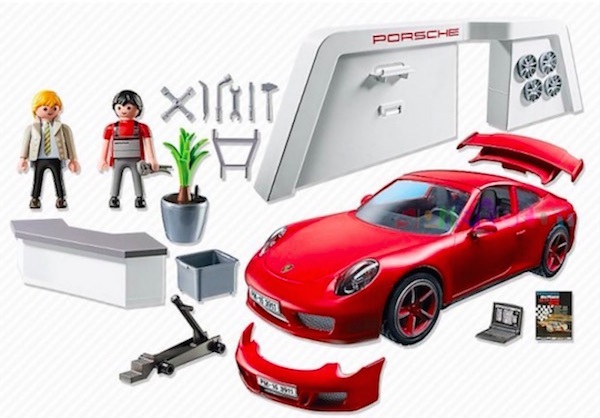 Update February 8, 2016: It's been nearly a year since we first announced this new Porsche set from Playmobil. Well, for those of you who have been waiting, it's finally available here in the U.S. You can pick one up via Amazon.com for $44.99 $69.99. Update #2 February 8, 2016: Wow! Looks like the seller really increased the pricing since we announced this about two hours ago. Let's see if pricing returns to normal once demand cools down a bit. Update #3 February 8, 2016: Look like pricing has returned to the normal $44.99 with free shipping. 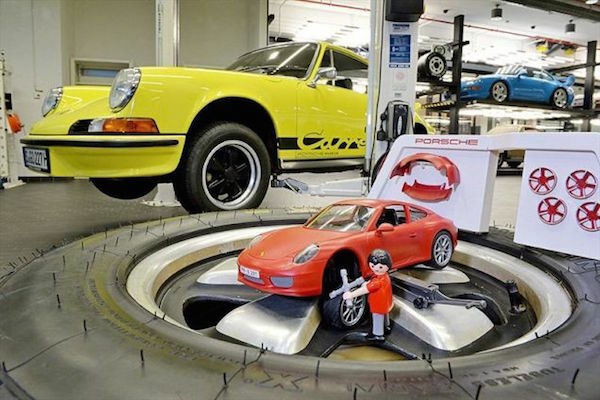 It wasn't too long ago that we told you about the two new Porsche play sets coming available from LEGO this Spring. 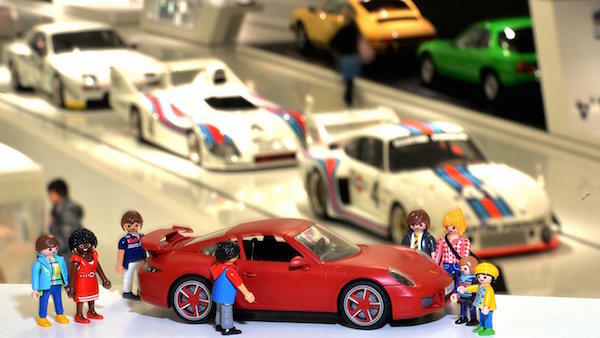 Now, another of our favorite toy manufacturers, Playmobil, is joining forces with Porsche and releasing their own set as part of their "City Life" collection. 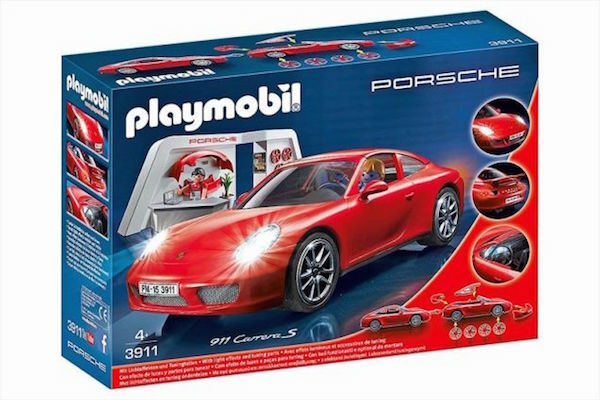 Launched earlier this month in Germany, the Playmobil 911 Carrera S features a detachable roof and includes a Porsche Exclusive lounge area where you can swap the 911s front and rear spoilers to Aerokit versions as well as change up the Porsche's overall look by changing out the wheels. A special, miniaturized light module provides working front, rear and dashboard lights, too. What's It Cost And Where Can You Buy It? We spoke with Playmobil last week and they asked that we emphasize that the product is not yet available world-wide. Right now, it has been launched in the following countries: Germany, Austria, Switzerland, Benelux countries, Scandinavia, Italy, Malta. More countries, including the U.S. will follow in 2016. Cost on the German Playmobil site is set at 39,99 Euros (which includes VAT but excludes shipping). Playmobil let us know they'll be sending a unit our way for review shortly and as we get closer to the launch date in the U.S. they'll be sending an additional unit for us to use as a giveaway here on the site so stay tuned for that! I've been a big fan of Playmobil for some time. Both as toys for my nephews and as pieces to add to my own collections. I expect, given what I know about their quality, that this one should be no different. This is truly a great looking toy! I want one as soon as I can have one in the United States. ! Can my local dealership order it for me? I don’t believe your dealer can get one for you. Playmobil told us they should be available this fall in the US. We’ll keep you updated.